Summer is upon us with its long days and torrid suns, but we continue to travel the world in the name of spreading bande dessinée love. This week we are crossing the ocean to California for the Comic-Con International: San Diego. Our Rights Director Sophie Castille will be representing Mediatoon together with the Europe Comics project, so look for her at booth 5524, where we will also be welcoming three stellar European authors in honor of recent American releases. 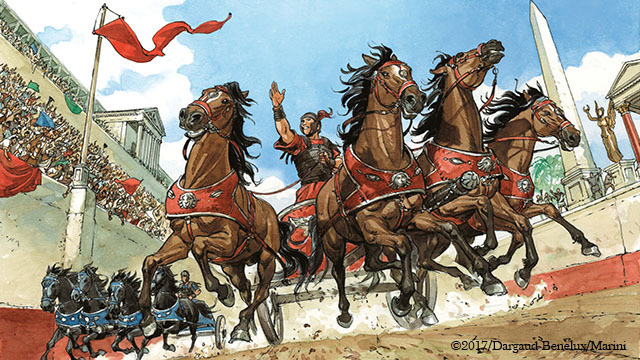 Enrico Marini (author of the acclaimed series “Eagles of Rome” pictured above), Efa (author of “Monet,” up for an Eisner Award this year! ), and Zerocalcare (author of “Kobane Calling” and “Tentacles at my Throat”) will participate in panels and signing sessions not to be missed. Please consult the Europe Comics website for details about each event, and make sure to stop by our booth to say hello! In other news, our publishers have been busy cooking up some sizzling titles for the summer months. Dargaud’s best-selling children’s series “Monsieur Blaireau et Madame Renarde” (Mr. Badger and Mrs. Fox) has become a very successful animated series (to be launched internationally very soon) and is introducing its sister series “La Famille Blaireau-Renard” (The Badger-Fox Family), exploring the theme of emotions. You’ll find these and many more new releases in the newsletter below, with previews of the first few pages and information about the authors and series. As always, we look forward to hearing from you.